Offering Garment Rolls and Bags can be a nice touch at the end of a sale. At American Retail Supply, we have Garment Bags and Rolls that keeps your clothing free from damage like water, as well as keeping free of wrinkle and crease. This shows the customer that you care how their garments will look when they see it at home. The extra effort will go a long way and set you apart from the rest. Garment Rolls is made of Low Density Plastic material which is lighter than others. Since we use this material, our garment rolls are also cheaper. 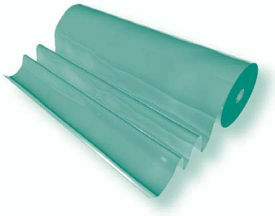 We currently only stock clear garment rolls, which is great to easily distinguish different garments. These can have from 250-450 per roll. Garment Bags come in Navy Blue color in two different sizes. Choose from either 48 inches or 57 inches tall. These Garment Bags are made of nylon material which makes them water-resistant, resistance to mildew, and strong enough to hold multiple suits and garment.